We started in 2007 jutting down real-time decision NFL picks against the spread. An algorithm was built to analyze offensive, defensive, spread, team, and other stats. Most times, we just make the computer NFL pick, but sometimes there are players injured and different other conditions that we need to consider to pull the game out of the picks. 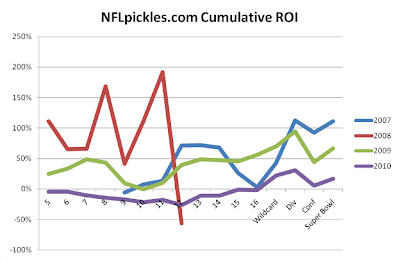 I thought about pulling all kinds of stats regarding NFL Pickles, you can see many of these at thepredictiontracker.com. But I realized there is only one metric that matters, return on investment. Not the percentage against the spread (ATS), but ROI. At NFLpickles we weight each week and game differently and using various percentage of bankrolls through out each week (more is used at the end of the season, from 15% to 25% of bankroll). Therefore, this metric is the one that makes most sense since it is the one we are trying to optimize. As you will above, each year I start trending upwards starting at around week 10 to 11. On the playoffs I do well and have finished with 111%, 67%, and 17% (last year). In 2008, is when we implemented using Kelly's Formula in order to avoid the same variations we saw that year. 2009 and 2010 look surprisingly similar after week 10. We hope this year is a very successful one! Welcome back for another year, J. I'm still halfway around the world trying to pick winners on scant information. v-zero, you are right. I need to find another name for this metric. dtby, welcome! This year I'm in Dallas working and need to connect remotely to the computer I use to run the stats. Having some problems connecting right now which I hope to solve so I can get the picks out before tomorrow.